Kirk Gostkowski and Timothy J. Cox in Talk Radio. Photo by Michael Benabib. BOTTOM LINE: A slow paced show, but it sure is wonderful watching Kirk Gostkowski work his magic. Talk Radio takes the audience into the world of radio talk show host Barry Champlain (Kirk Gostkowski) in Cleveland, Ohio. Champlain is on the brink of his show going national, but first he has to survive a hectic night on the air. Of course all of his callers on this particular night are extremely strange. One has an unconventional relationship with his cat while another is a frighteningly antisemitic man. Some love him and others hate him, but either way Barry drinks his way through each conversation. For Barry “talking is living.” Well, he doesn't just talk. He yells at, hangs up on, and insults his callers, whether first time or long time listeners. Champlain's brash demeanor is not only limited to his show. He uses the same disrespect with his producer, the station manager, and everyone who works with him. Even sleeping with coworker Linda (Christina Perry) does not deter his rudeness. As the night progresses though, his grasp on his sanity seems to slowly slip away. With his boss Dan (Timothy J. Cox) at his throat about the corporate sponsors Barry does his best to piss Dan off as he talks about drugs, garbage disposals, and war. Those closest to Champlain reveal his past through a series of monologues spliced throughout the show. We hear how he started in Akron, Ohio and his lack of a life outside the show. Everyone has a story about meeting him, but no one knows much about him beyond that. 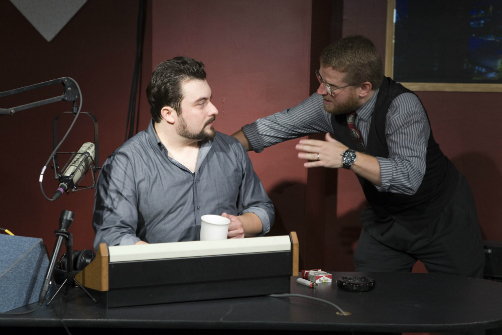 Talk Radio premiered off Broadway in 1987 and was revived for its Broadway premiere in 2007. Though it has its place in theatre history, I fear that younger people might not connect as much to the construct of a radio station. I enjoyed this play, but considering it is all about a disembodied voice, the visual action is minimal, causing it to drag on in the middle. You have to put your listening ears on, but if you do you are rewarded with a variety of topics and humor (still relevant today.) On the other hand, Gostkowski really fits the bill for Champlain. His voice caresses our ears as his words cut through glass. This character is our main focus and Gostkowski earns that focus. I was eager to go on the same emotional roller coaster that he was riding, though there are some tunnels and dips that could stand to pick up the pace a bit. All in all though, it is a fun ride.